A couple of other bloggers pointed out that yesterday (February 28) was the anniversary of the death of Eric Frank Russell in 1978. In belated recognition of this, here is an edited rehash of a couple of EFR-related articles from my Astounding Science Fiction website. Besides being one of the best science fiction writers of the 1940s and 50s, Eric Frank Russell (1905 - 78) was an enthusiastic follower of Charles Fort, and served as British representative of the Fortean Society. 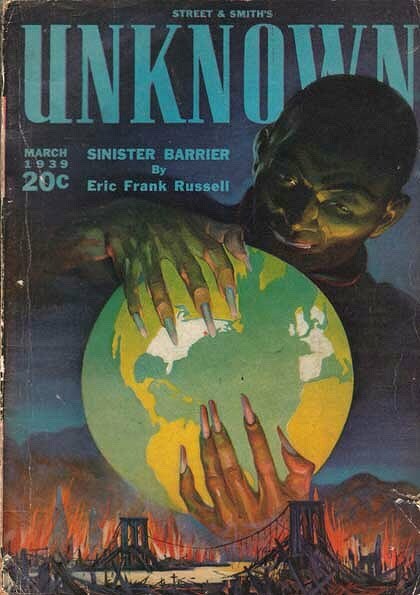 Russell's first novel Sinister Barrier was published in March 1939 in the first issue of Astounding's sister magazine Unknown (pictured at left). While there had been Fortean-themed stories before this, Sinister Barrier qualifies as the first really Fortean novel. It isn't as slick, either in characterization or plotting, as Russell's later novels such as Dreadful Sanctuary , but the story is still packed full of Fortean weirdness and invention. In terms of plot, it's a relatively straightforward conflict with a race of powerful and elusive aliens... a theme EFR later addressed in more polished form in Three to Conquer (1955). However, the novelty of Sinister Barrier lies in the way the story is presented -- as a fictionalized speculation regarding the origin of a wide range of Fortean phenomena (lights in the sky, mysterious disappearances, extra-sensory perception...). In an "Author's Note" at the start of the story, Russell says that Sinister Barrier is "as true a story as it is possible to concoct while presenting believe-it-or-not truths in the guise of entertainment". He cites a number of real-life sources behind the ideas in the novel, including Charles Fort's own speculation "I think we are property". In true Fortean tradition, Sinister Barrier is packed with odd little newspaper clippings... and in keeping with Russell's stated intention of presenting fact in the form of fiction, these are all real news items. As Russell himself says, "every back-dated press item mentioned in this story is absolutely authentic". Sinister Barrier is also significant as one of the first truly paranoid novels of science fiction. Here is the full quote from which the title is taken: "Beyond that sinister barrier of our limitations, outside that poor, footling range of vision, bossing every one of us from the cradle to the grave, invisibly preying on us, are our malicious , all-powerful lords and masters, the creatures who really own the Earth." Russell is yet another excellent SF writer whose work seems largely forgotten (over here in the States, anyway). Fortunately, his books are easy to find in used bookstores. Yes, it's the same here in the UK. I've managed to pick up and read most of his work over the last 20 years, and I'd certainly class him as one of my top 3 or 4 SF authors. Sinister Barrier was a very early work, and although it's an interesting subject it's not a great story. But by the late 40s and 50s Russell had perfected his style and wrote a string of great works. A couple of years ago I read a comprehensive biography of him called "Into Your Tent" (by John L. Ingham). Sadly that put me off him a bit! Nothing really negative about his work (although Alamagoosa is bordering on plagiarism), but he doesn't seem to have been a nice personality at all. He had a talent for "not making friends" - which may partly explain why his reputation sank so quickly after he died.